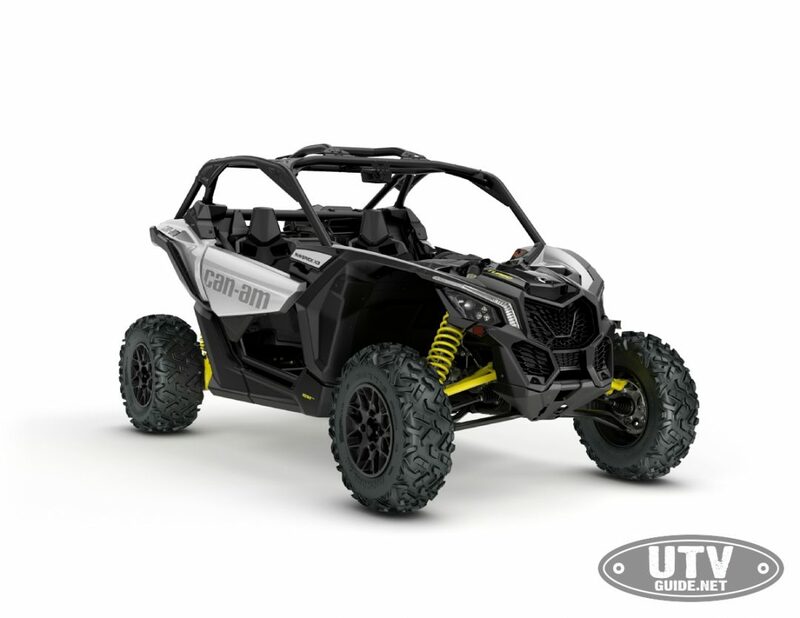 The Can-Am Maverick X3 side-by-side family also now includes a 120hp Maverick X3 Turbo side-by-side. 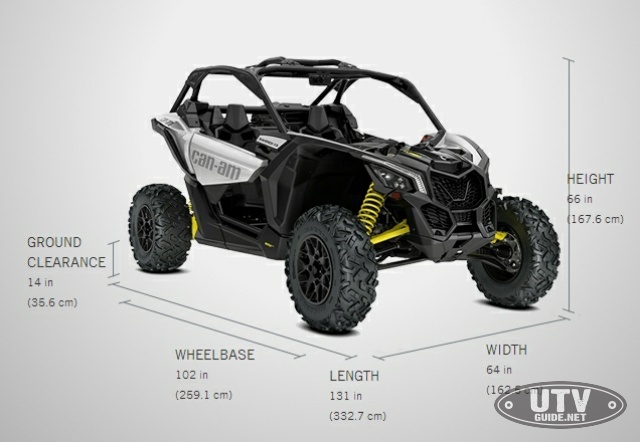 The new vehicles, offered in two- and four-seat packages, start at less than $20,000 USD* and come standard with many of the performance features for which the Maverick X3 is known. The next generation of accessible high-performance is here: , With quick, efficient response and unbeatable all-round value, the 2 or 4-seat 120 horsepower Maverick X3 Turbo goes head-to-head against the Polaris RZR XP1000 (110HP starting at $19,499) and Yamaha YXZ1000R (112 HP starting at $19,999). Different fuel pump – 120 HP uses MY 2017 154HP. 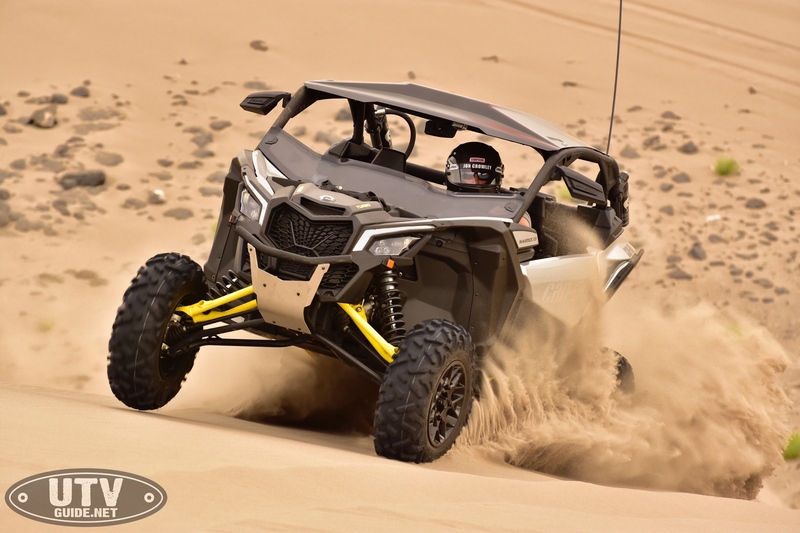 120 hp turbocharged Rotax® ACE engine – conditions such as desert, dunes, rocks or trails with quarter doors and a dominant vehicle posture for optimal off-road capability with no compromise to line-of-sight. Responsive, refined performance is more accessible than ever with the all-new 120 horsepower Maverick X3. Like its bigger brothers, its turbocharged Rotax ACE engine is tuned for torque and seamless, shift-less power for the rush to redline. 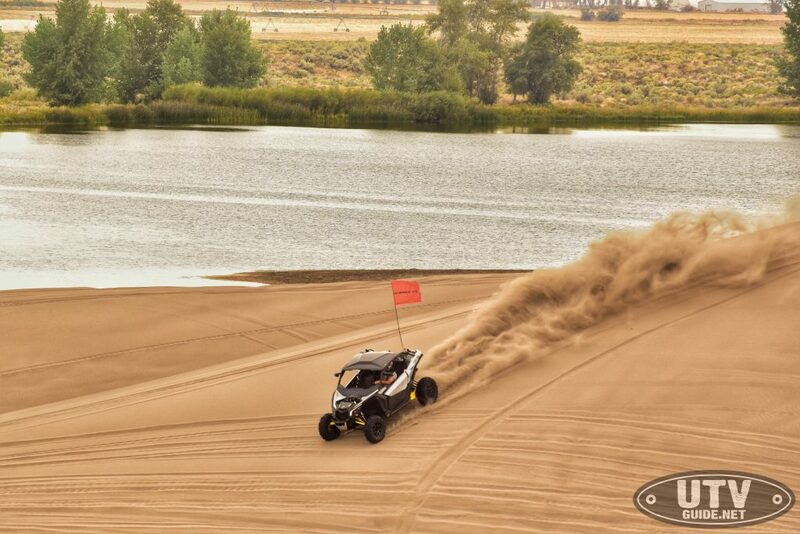 Advanced airflow dynamics – With an intake and exhaust tuned to maximise power, efficiency, and throttle response, the Can-Am Maverick X3 will never be starved for performance. Three oversized, out-of-the-way intakes feed the engine and the CVT with clean air and keep temperatures low, with a sport exhaust out back to let the Rotax ACE engine roar. Ultra efficient and lightweight chassis – The Maverick X3 features an ultralight, rigid chassis made of state-of-the-art Dual-Phase 980 steel. So? Figure 53% better torsional stiffness and still 20% lighter than its closest competitor. TTX suspension with industry-leading travel – Can-Am’s four-link TTX suspension with 20-in of travel features a trophy truck-like trailing arm and three links dedicated to controlling camber while delivering optimal geometry at all times, even during extended wheel travel. The result? Unparalleled power transfer to wheels, virtually no bump steer, precise steering response, and more confidence at higher speeds. 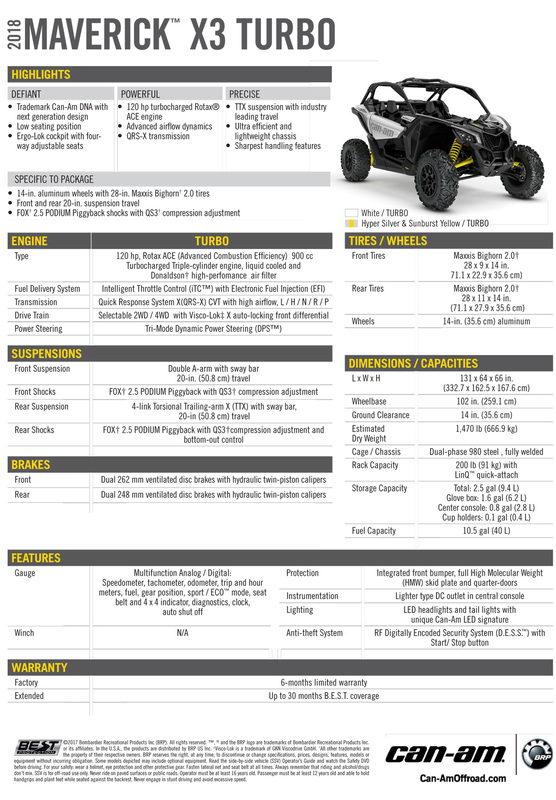 Sharpest handling features – From its arched double tubular A-Arm and sway bar up front to its race-inspired quick-ratio D-shaped steering wheel, Tri-Mode DPS system, and Intelligent Throttle Control (iTC), the Maverick X3 provides precise handling even in rough terrain or at high speed. Ergo-Lok cockpit with four-way adjustable seats – Everything is in its right place, from the sports car-like centered accelerator and brake pedals to race-inspired, flat-bottom steering wheel that tilts up or down 25°. The four-way adjustable seats – 2 inches in height and 6 inches in slide, ease of accessorization, and integrated wiring allow it to truly adapt to its owner. Low Seats, Bold Stance – Its low seating arrangement is designed to encapsulate both driver and passenger so they feel connected to the vehicle’s every move, without compromising ground clearance. Its high and dominant posture is enhanced with race car-inspired one-piece molded seats with ideal support, weight distribution, and 4-way adjustablility. 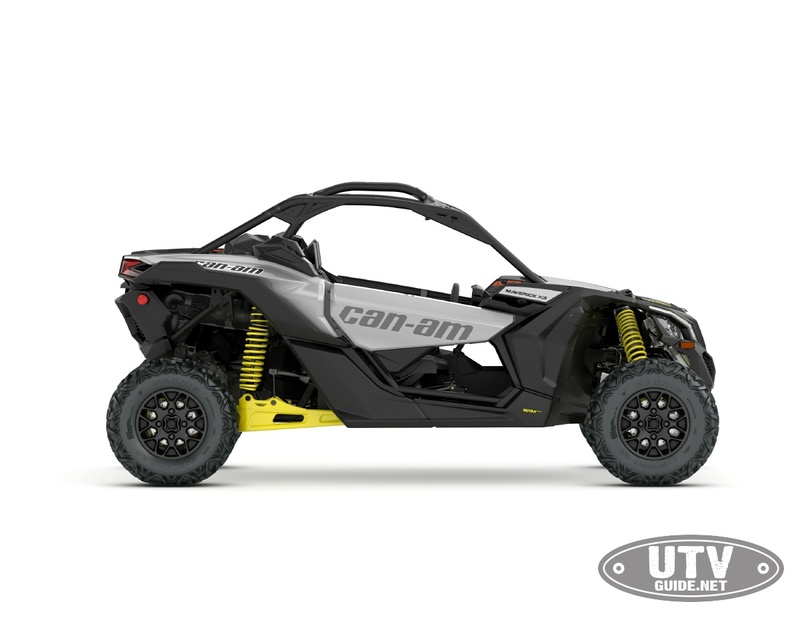 Trademark Can-Am DNA with next generation design – The Maverick X3’s intensity comes from a mix of performance-driven mechanical and structural design, from its signature LEDs to its advanced cockpit. Choose between Hyper Silver & Sunburst Yellow painted coloration or White coloration, if you can. Roll on with strong 14-in aluminum wheels (non-beadlock) and 28-in Maxxis Bighorn 2.0 six-ply tires. Built to withstand rough terrain, sturdy lugs and a non-directional tread pattern ensure a smoother ride.